New media have come to play a prominent role in civic and political life. Social network sites, web sites and text increasingly serve as both a conduit for political information and a major public arena where citizens express and exchange their political ideas; raise funds; and mobilize others to vote, protest, and work on public issues. This chapter considers how the ascendency of today’s new media may be introducing fundamental changes in political expectations and practices. Specifically, we see evidence that new media are facilitating participatory politic — interactive, peer-based acts through which individuals and groups seek to exert both voice and influence on issues of public concern. While these kinds of acts have always existed, evidence suggests that new media are providing new opportunities for political voice and discussion, thus increasing the role of participatory politics in public life. In this chapter, we provide a conceptual overview of the implications of this shift for how political life is organized, emerging political practices, and pathways to political engagement. 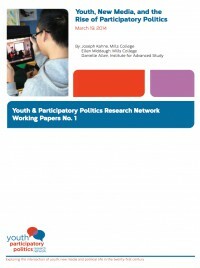 We focus our analysis on youth, who are early adopters of new media, and provide some empirical evidence to demonstrate the importance of participatory politics to their political life as well as to highlight some benefits as well as risks associated with this form of political engagement.